The Michael Jackson 1987 music video “Smooth Criminal” is a classic. In one scene, Michael Jackson was able to lean forward to about 45 degrees while maintaining a straight spine, appearing to defy gravity. Many other people have tried to replicate it, but this move would seem to be impossible from a biomechanics point of view. Nishant Yagnick and colleagues from the Postgraduate Institute of Medical Education and Research in Chandigarh, India analyzed Michael’s biomechanics in an article published in the Journal of Neurosurgery: Spine. Most trained dancers with strong core strength can only reach a maximum of 25° to 30° of forward bending while performing this action. It has now been revealed that Michael Jackson was able to perform this move with the help of specially designed footwear. 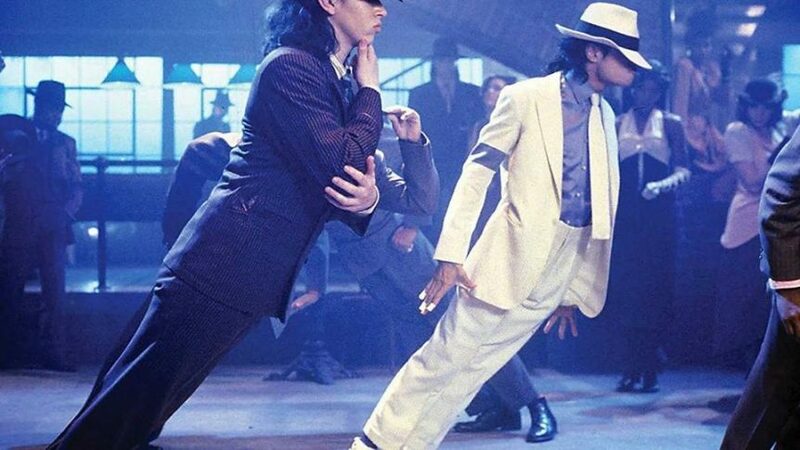 His shoes had a V-shaped slit in the bottom of each heel, and were latched to a metal peg driven into the ground, which allowed Michael to lean forward in what seems to be a gravity-defying move. However, even with this patented footwear and the support of the latch to the metal peg, the move is still very difficult to perform. It requires extremely good core strength from strengthened spinal muscles, as well as very strong lower limb muscles. When the authors of the study state: “…bend forward with a straight torso, keeping our hip joints as the fulcrum…”, they are referring to anterior tilt of the pelvis at the hip joints. Then when they state “…when the fulcrum for forward bending is shifted to the ankle joints…”, they are referring to the legs dorsiflexing at the ankle joints toward the dorsum of the feet (the closed-chain reverse action of dorsiflexion of the feet at the ankle joints relative to the legs, which is the typically thought of open-chain standard joint action of dorsiflexion at the ankle joint). Unfortunately, we cannot quite see the ankle joints in the accompanying photograph, but we can see that the bend in Michael Jackson’s body must be happening at the ankle joints. Pushing our bodies further and further in the interest of art with all the challenges and stresses to the body that accompany this pursuit, is a noble endeavour. However, nobility is one thing and creating an injury that may cause pain and affect our ability to function for the rest of our lives is another matter. Certainly, the best way to prevent myofascio-skeletal injury is to be as strong and as flexible as possible. But even when we optimize these aspects of our body, we still need to be mindful that there are limits to the physical stresses that our tissues can endure. So, let’s all be healthy and work hard toward our goals for our art or for our sport, but be attentive and listen to our body’s responses to the demands we place upon it, and prevent injury. This blog post article was created in collaboration with www.terrarosa.com.au. The authors stated that Michael Jackson challenged our understanding of the modes and mechanisms of movement, the limits of movement, and therefore mechanisms of spinal injury. Dancers often try to perform increasingly challenging moves by jumping higher, stretching farther, and turning faster than before. These new moves create stresses on the spine that can cause injury. Did you know that Digital COMT (Digital Clinical Orthopedic Manual Therapy), Dr. Joe Muscolino’s video streaming subscription service for manual and movement therapists, has an entire folder with video lessons on anatomy and physiology (kinesiology) as well as an entire folder with video lessons on pathomechanics of common musculoskeletal conditions? Digital COMT adds seven new video lessons each and every week. And nothing ever goes away! Click here for more information.